Is the future of education teacher-robots bumping into walls? COLUMBUS, Ohio – Thomas Hatch noticed something unusual in a reflection on his laptop screen as he worked on a lesson one day in his pod at high school. The teenager turned around. He was face-to-face with a teacher of an online course. Well, sort of. The teacher’s face was encased in a small video screen. His body was a four-foot-tall plastic tower on wheels. 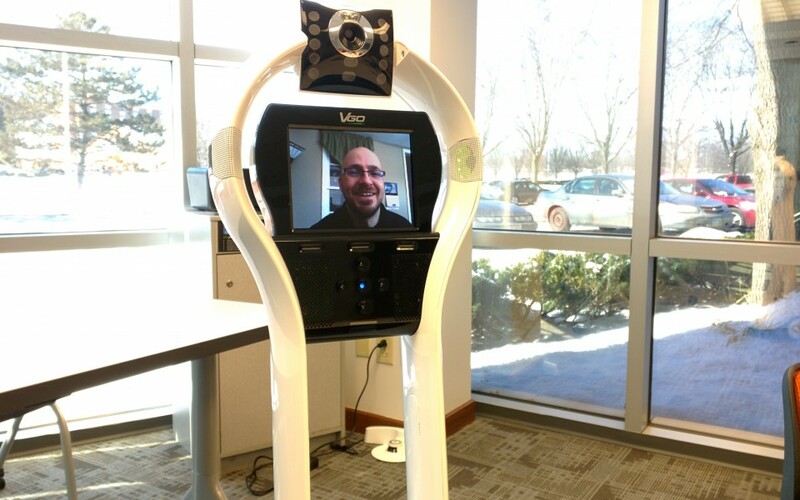 He maneuvered the telepresence robot around the classroom and spoke to students using controls on his computer from a remote location. “It was, um, different – definitely different,” Hatch said of his first encounter with the robot last year, when he was a junior at the Nexus Academy of Columbus. The public high school in central Ohio blends online and in-person instruction in an open, office-style building located in a small industrial park. The school has some in-the-flesh teachers, but many teachers never set foot in the building, because they teach only online courses – some from locations quite far away. Most of the time, the remote teachers interact with their students through a computer screen or phone call. 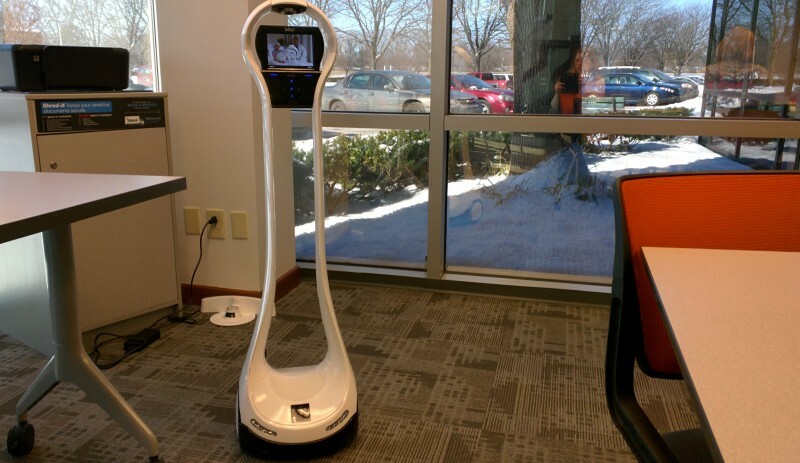 The new telepresence robot provides another means of communication with students and staff in the building. Related: What does blended learning look like in a classroom? The telepresence robots in the Nexus Academy charter schools cost about $6,000 each to buy, plus another $1,100 in yearly upkeep, the principal of Nexus Academy of Columbus said. The Nexus Academy of Columbus is part of a network of seven charter schools in Ohio, Michigan and Indiana. They started with one telepresence robot in one school three years ago, and then added a second, in the Columbus school, last year. This school year, all schools have one robot. What makes these robots better than a video chat on a stationary computer screen? Some teachers and students at the Columbus school said it creates a different dynamic. A phone call or a web chat requires two people – someone has to answer on the other end of the line. With the robot, the teacher can log in and zoom around without anyone lifting a finger inside the school building. It gives the teachers a measure of control. If they need to speak to someone, they can log in and go find the person, without waiting for someone else to take action. Lights flash on the robot body when a teacher signs in to control the robot. A screen the size of a small tablet computer shows a live video of the teacher’s face. A webcam flips open above the screen, revealing the Cyclops eye that helps the long-distance teacher “drive” around the school. They zip around the school just like any other teacher – except when the robot crashes into walls and doorways. The depth perception and peripheral vision aren’t great, Fetch said. But the technological hiccups don’t bother him. The school’s brick-and-mortar location is open abbreviated hours; students can choose either morning or afternoon sessions offered four days a week, and are required to do at least 12 hours of schoolwork off campus. The curriculum is designed to be preparation for college. The 120 students and 10 in-person staff report to the school building a few days a week at required times to work together. Another 50 teachers are online-only teachers who instruct a variety of classes, both here and in other schools. Related: What happens when computers, not teachers, pick what students learn? Students use technology to log into classes when the school isn’t open. They must do work remotely – they can’t accomplish everything if they don’t, Hursey said. Each student has a laptop. The school tests additional technology on a small scale before making a big investment, Hursey said. The robots cost about $6,000 each to buy, plus another $1,100 in yearly upkeep, she said. That’s why they started with one robot in one school to see how it worked before buying one for each school. The leaders and the teachers constantly reassess all technology used in the schools, she said, to make sure it’s used and useful. 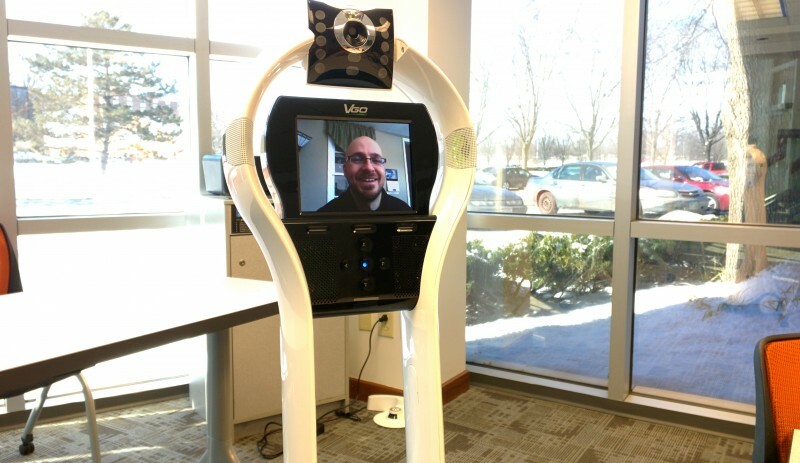 Use of telepresence robots is not unheard-of in schools. Some schools have used them to give students with medical issues a way to attend class. There is some research about the psychology of communication through telepresence robots, which are used outside of schools, too. In a sign of the growing popularity of this technology, a TV show on CBS, “The Good Wife,” featured an episode when office assistants used telepresence robots to work from home. Those robots crashed into walls quite a bit, too. The humor in robots lurching around the school isn’t lost on the teachers and students at the Nexus Academy in Columbus. The principal considered putting a T-shirt on the robot body, to provide the futuristic tower with a more human-like form. She decided against it. “It might make it weirder,” Hursey joked. This story was written by The Hechinger Report, a nonprofit, independent news organization focused on inequality and innovation in education. Read more stories about blended learning, and stay up to date on the latest trends by subscribing to our free newsletter.